1: You gain 1 life every time one of your artifacts goes to the graveyard. Can only give 1 life each time an artifact reaches the graveyard. 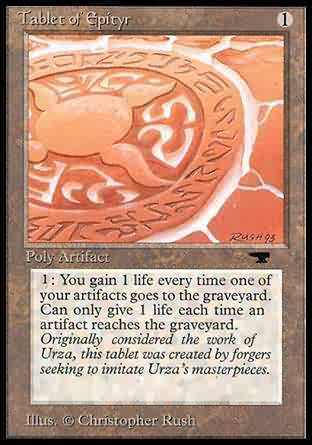 Whenever an artifact you control is put into a graveyard from play, you may pay 1. If you do, you gain 1 life.